Look, look what I got! I bought myself a swift in anticipation of having to wind a billion yards of laceweight for the shawls that I want to knit. And look, look, it works! It’s more dumpling-shaped than cake-shaped, but it’s definitely a center-pull ball. This is Sundara’s scrumptious silk lace, in one of her unrepeatable somewhat-solid colorways. You’ve seen this before, and I’m now almost positive it’s going to become a Print o’ the Wave stole for myself. 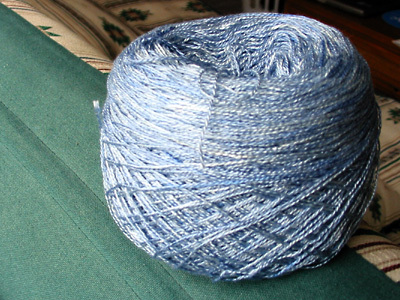 This was a hank of navy Merino Oro for the Myrtle leaf shawl and now…yuck. 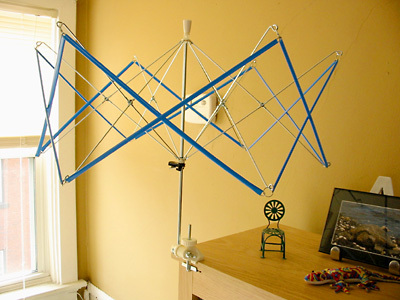 Even a swift can’t help you wind yarn that’s already gotten hopelessly tangled in the hank. 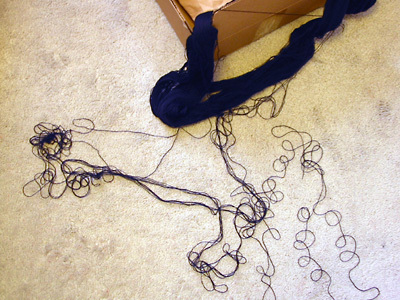 So, despite my best efforts to avoid exactly this scenario, I will be winding 1375 yards of cobweb-weight yarn by hand. Assuming, of course, that I can get it untangled. CogKnition posted this on March 10th, 2007 @ 11:34am in Knitting Goodies, Life as a Knitter, Yarn | Permalink to "A Swift Kick in the Pants"
Awesome! Can I send you a bag of horrendously tangled merino? Now *that* would be a great service for knitters, don’t you think? Send them a bag of yarn and a bag of money, get back a nicely untangled, freshly-wound center-pull ball. I had that tangle happen to me with a skein of Skacel Merino Lace (but it was my fault for not having a swift and not the skein’s). I usually like untangling yarn, until it got to hour 7 with the job still not finished.